As a believer, I love reading about the miraculous ways God used ordinary people to do extraordinary things! How great would it have been to be Enoch, who was taken up to heaven instead of facing death? Or Sarah, who, despite her old age, believed that God had the power to give her the desire of her heart – a child. The author of Hebrews “doesn’t even have time” to tell us about how the prophets conquered kingdoms and stopped the mouths of lions (v. 33). Reading this passage gets me pumped about following Jesus! It shows that if we have faith in a God that is mighty, we can take on the world! And then there are verses 36-38 in the same chapter, which can be a bit….deflating, to put it mildly. Suddenly being a hero of the faith doesn’t sound so glamorous. What happened to the power we have in a conquering King of Kings? And how often do we, as Christ-followers, follow a similar “up-down pattern”? We experience mountain-top-highs full of euphoric close-to-Jesus-moments, but then….the suffering, the mocking, the trials, afflictions, mistreatment, and feeling like a wanderer come closing in. What makes us victorious then? 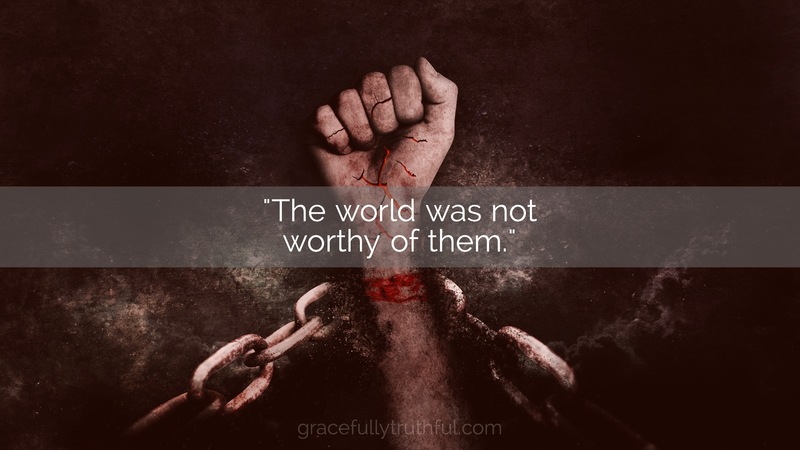 How can it possibly be said of us, “of whom the world was not worthy”? Hebrews 11:1-35 paints a rosy picture of what it looks like to walk according to God’s will. If taken at face value, we can miss the trials and tribulations that many Biblical heroes faced before their triumphant moments and overlook the fact that Christ Himself tells us that to be His follower guarantees tribulation and persecution. The morally upright and innocent Abel was despised and killed by his own brother. Faithful and brave Noah was mocked by the world for building an ark. Abraham and Sarah left all they knew for a land unknown, trusting God’s leading. Joseph was tricked and sold into slavery by his brothers long before he became a political leader in Egypt. What about your story? How have you been scaling mountains only to later be groping in the darkness of trial and persecution for following your Lord? In a world where joy and perfection is expected, it’s easy to lose sight of our solid and sure victory because of Whose We Are. Instead of looking at Hebrews 11 and becoming discouraged by the trials these heroes faced, we can see the eternal victory behind their temporary un-justice. 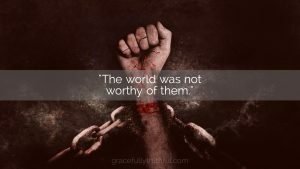 The world was not worthy of them because the power of God filled them! The mighty influence of the God of Creation fueled the faith and obedience that set these brave men and women apart from their culture. The same power is available to us as well! When we are brave enough to say no to the treasures of the world and yes to God’s plan for us, the world becomes unworthy of us. Christ has promised that He has already overcome the world. The afflictions of this world are only shadows compared to the holiness of God and the riches of heaven that await those in Christ. In fact God, in His beautiful irony, flips the table on the world’s idea of success – it is those who suffer for Him that will inherit the world. Take heart, walk in bravery, Christian, and rejoice in suffering because you have been counted worthy of Christ! Thanks for joining us today as we journeyed into Brave Week One! Don’t miss out on the discussion below – we’d love to hear your thoughts! Looking for other journeys from this theme? Here’s a link to all past studies in Brave! Looking for yesterday’s Journey Post? 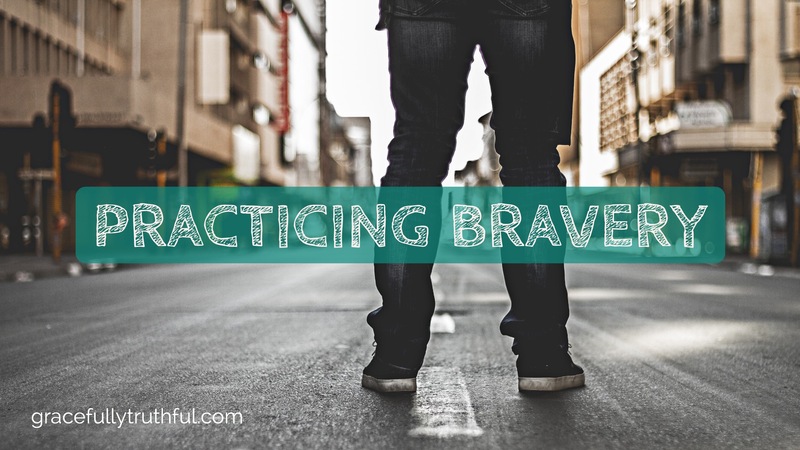 Check out Practicing Bravery! 7 Have nothing to do with irreverent, silly myths. Rather train yourself for godliness; 8 for while bodily training is of some value, godliness is of value in every way, as it holds promise for the present life and also for the life to come. 1) What are the myths that are referred to in verse 7? 2) Why is training for godliness better than physical training? 3) How does a person train for godliness? 1) The NASB translates “irreverent and silly myths” as “worldly fables fit only for old women.” The KJV has “profane and old wives’ tales.” The original Greek word actually means old womanish or silly. So the idea here is that Timothy is not to spend his time on things that are not biblical. Whether it’s false teaching, gossip, or unbiblical self-help books, there are tons of things competing for a godly person’s attention. Instead, we are to train ourselves to be godly. 2) Verse 8 answers this question—physical discipline helps us only in this life, but godliness helps us in every way both now and in the life to come. 3) Training in the form of physical exercise was valued in the Roman world, so the imagery of an athlete training for competition is used throughout the New Testament. Paul urges Timothy to train, or discipline himself toward godliness. Godliness has the definition of reverence, respect, or piety (devotion). Timothy is to increase his reverence and devotion to God. This only happens when we put our minds to study the truth found in Scripture, when we pray, and when we learn to listen to the Holy Spirit’s guidance. 1) This phrase “irreverent and silly myths” makes me want to be sure that I am focusing only on truth! Be like the Bereans, who “received the word with all eagerness, examining the Scriptures daily to see if these things were so.” (Acts 17:11) Later, in chapter 6:11-21, Paul urges Timothy again to avoid “irreverent babble and contradictions of what is falsely called “knowledge.”” There are so many “good sounding voices” that can call us away from the most important focus: the gospel of Christ. We must devote ourselves to studying the truth, living the truth, and loving others with the truth. Everything else is just noise and not worth building the foundation of our lives upon! 2) Although physical fitness is important, many people spend much more time exercising than they do pursuing holiness. Still others neglect both disciplines! Do my priorities reflect that I believe godliness is important? In 1 Corinthians 9:19-27, Paul talks about how he literally shapes his life to be gospel-sharing-focused as he again uses the comparison to physical training. He charges us to be disciplined and self-controlled as we use our everyday lives to share Jesus. Does this describe my life? Take a quick inventory and jot it down on paper to get a good look. How have you shaped your life to make sharing Jesus and living the gospel your number one priority? In what areas will you ask the Spirit to teach you more discipline? 3) Which area of your “godliness training” regimen could use some improvement? Ask God to help you discern what He would have you do this week to increase your reverence and devotion to Him—and then commit to following His leading. Remember that small shifts in our everyday moments, make huge impacts over time! Thanks for joining us today as we journeyed into Brave Week One! See all past studies in Brave! There it is. My biggest weakness, dread, challenge, fear, fill-in-the-blank. I feel a bit nauseated to even type the words. It’s funny. And by funny, I mean irritating. I have no problem or hesitation when leading countless others into times of worship – I actually look forward to and love it! Perform in plays or musicals? No problem. Sing for a panel of judges? I might feel a few butterflies, but nothing major. I’ll power through. Stick me in front of five or more people and tell me to talk about something, however, even something I’m passionate about, and I begin to feel light-headed. I fiddle with my shirt. Papers. Anything within reach. I twirl my hair. Begin to stammer. I repeat my words, knowing as I speak them that I sound foolish…but I can’t seem to stop myself. My neck flushes and I feel my cheeks burning. My palms grow clammy, my forehead begins to perspire and my heart threatens to gallop right up my throat and out of my mouth…soon to be followed by the contents of my stomach. I know full well that absolutely nothing is going to harm me, that my worth is not determined by how eloquent or smooth my speech may or may not be, and that people do this all the time. Some people actually enjoy it! I know all of this, yet I have experienced these feelings every single time I have ever faced this task. Maybe you struggle with heights. Spiders. A room full of (albeit friendly) strangers. The prospect of a new relationship. Being alone. Darkness. The thought of losing someone close to you. Debilitating illness. The prospect of death. Maybe it is something I haven’t mentioned. It’s the thing that creeps into your subconscious when you least expect it. You’ll recognize it when your heartbeat accelerates and your breath becomes a little more shallow. There it is. That’s the one. We all face things that give us the opportunity to choose fear in this life. That’s a given. But we do not have to be defined by our initial physical, mental and emotional responses in the face of those fears. We know that God did not give us a spirit of fear, but of power, love and a sound mind. We can and should pray for help in facing fear, in dealing with our reactions and for boldness, but we (and I am absolutely talking to myself here) are not helpless. Just as soldiers train for battle, we are capable of practicing bravery by intentionally training ourselves to be godly. So…what does that look like? 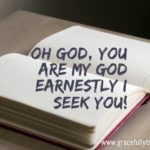 How do we go about training ourselves to be godly? We spend quality time with the One we most want to emulate. Time in prayer, communicating with Him. Time just listening for Him. We feed ourselves a steady diet of truth by spending time in His Word, daily. 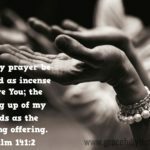 We acknowledge and spend time with Holy Spirit, and practice our listening skills by exercising spiritual discernment in every area of our lives. I will be the first to admit that I have never gone out of my way to accept a public speaking engagement…in fact, if there has been a way out (any way out), I have always taken it. Does that resonate with you? 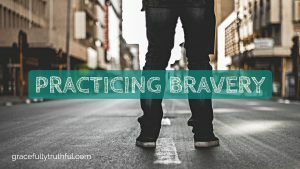 Rather than cowering in the face of our fears, maybe it’s time you and I begin to practice bravery by training ourselves to be godly and putting our faith into practice. Holy Spirit, give us the discernment we need to recognize the spirit of fear and the boldness we need to apply the Word to our reactions and actions in the heat of the moment. Help us train ourselves to be godly, and instill in us a desire to serve You through our thoughts, words and actions. Give us the will to persevere when we are stretched. Saturdays and Sundays are a chance to reflect, rest, and re-center our lives onto Christ. 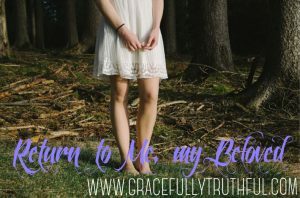 Don’t miss the opportunity to connect with other women in prayer, rest your soul in reflective journaling, and spend time worshiping the Creator who longs for intimacy with each of us! 1) What are some things you would like to leave as a legacy? How can you start today to develop those so you can pass them on? 2) Who is one person that is different from you that is difficult to love? Think of them. Pray for them. Allow His love to be your language to this person this week. 3) Make a small note to hang on your bathroom mirror with these words: I am loved by the One who made me. I am beautiful because I’m clothed in His righteousness! Lord, let me know my worth. Show me the places my pride is blinding me and leaving me separated from You. Remind me as I start comparing myself with my friends that your grace and righteousness has been extended to me. Renew my mind Father, take away the junk that I allow to swim in my thoughts and replace it with the truth of who You are and who I am because of Your love for me. Lord, help me to put on Your full armor every day. Help me to pray continually, and to remember that no matter the name or face man pins to the evil we see, my battle is not with flesh and blood. Father, heal our land. Heal my relationships. Heal my heart. 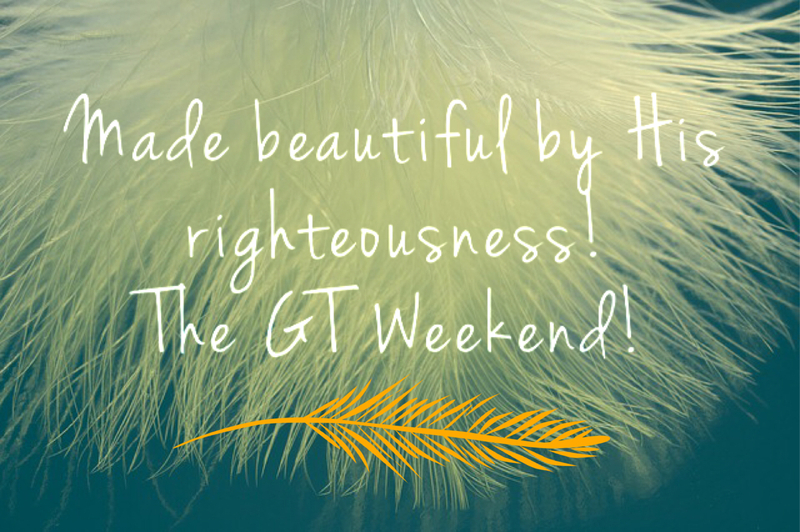 Click here to comment and pray with the GT Community! Want to connect with a GT Partner? We are committed to praying over and walking with you! 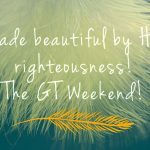 Sign up to have GT Journey Studies sent to you! What were your thoughts from the GT Weekend? How were you drawn near to the Father and encouraged in your faith? Share with the community and encourage other women! Destruction screamed around them. Smoldering fires of neighboring cities singed the air. Certain captivity loomed like a hawk circling its prey. The sounds of war grew ever closer, threatening all life. But Jerusalem. She partied on. Ignoring it all. She played dress-up, flaunting royal robes, continuing her game of vanity and pride, faking that all was well. She covered up the stench of death with a gaudy appearance. 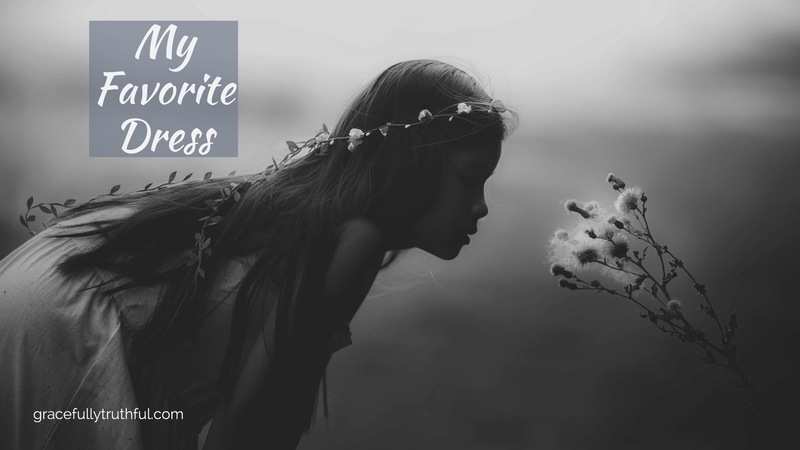 Despite the hundreds of years of warnings to return to the Lord, she carried on, pretending as if she were only a child playing dress-up, oblivious to anything but the image she wanted to see. She was playing at life while her heart was dead. Her destruction was certain and it did come, ruthless and relentless, the consequence of centuries of hardening her heart against her one true Lover, the Lord God Almighty. The vivid picture of destruction in Jeremiah 4 is awful, but far removed from us. Paul, in Ephesians 4, urges us not to walk any longer in futility, in emptiness, in darkness, or with hardened hearts. Suddenly, the imagery of Jeremiah 4 hits closer to home. we know we are faking at life while our hearts are dead. and the picture perfect life. Or maybe our pride looks different. Perhaps we wear it as a badge of honor that we “don’t have to wear cute clothes” or that we are “humble” enough to focus on others instead of taking care of ourselves. feigning beauty while we play with ashes. It’s easy to become disillusioned and get sidetracked from the God who sees us as exquisite treasures. Every time we compare, every time we aren’t satisfied (or when we are too satisfied), when we find ourselves “beautifying” our lives for others’ approval…tiny steps, each walking slowly away from the One who holds the secret to our Beauty and our fulfillment. “Return! Come away with me, my beloved! but look at how empty they leave you! look around and see the game for what it is. There is no depth without life in Jesus. There is no meaning without His purposes in our hearts. The beauty we try to create is a fleeting shadow unless we allow Him to clothe us in His righteousness. His garment will never fade, only becoming more precious the more often we wear it. allowing abundant fresh life to flood our weary souls. Trade your disguises for the richness of His royal robes! Thanks for joining us today as we journeyed into Beauty Week Three! Don’t miss out on the discussion below – we’d love to hear your thoughts! Looking for other journeys from this theme? Here’s a link to all past studies in Beauty! Looking for yesterday’s Journey Post? Check out My Favorite Dress! 23 Now before faith came, we were held captive under the law, imprisoned until the coming faith would be revealed. 24 So then, the law was our guardian until Christ came, in order that we might be justified by faith. 25 But now that faith has come, we are no longer under a guardian, 26 for in Christ Jesus you are all sons of God, through faith.27 For as many of you as were baptized into Christ have put on Christ.28 There is neither Jew nor Greek, there is neither slave[a] nor free, there is no male and female, for you are all one in Christ Jesus. 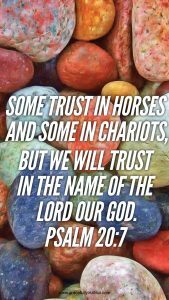 29 And if you are Christ’s, then you are Abraham’s offspring, heirs according to promise. 1) What is the greater context of this passage? 2) What does Paul mean when he says, “the law was our guardian”? 3) How do you “put on” Christ? 4) What do Christ and Abraham have to do with one another? 1) In the beginning of this chapter, Paul starts by asking the Galatians a question about who is taking them away from their faith. He worries that they are distracted by a false gospel so he uses Galatians, especially chapter three, to remind his audience of the truth of what they know. Paul reminds them of what true faith is and the purpose of the law in conjunction with faith. He reminds them of their true identity in Christ. 2) The word “guardian” in the original language specifically refers to a tutor or guide that was a trustworthy family slave. This guide was entrusted with the life and morality of the boys in their care. The boys were not even allowed to leave the house without their “guardian” until they had entered manhood. In the context of the law, the law was our guardian that led us to faith in Christ. It showed us our complete inability to be perfect and pointed us straight to salvation in the righteousness of Christ alone by faith alone. 3) With the idea of “putting on Christ”, Paul is referring to when a person becomes a believer and how we take on a new identity. Just like with a new dress, we “put-on” our new identity that is rooted in the fruit of the Spirit-love, joy, peace, patience, kindness, goodness, faithfulness, and self-control (Galatians 5:22-23). We put on Christ in the way we live our lives and the choices that we make, choices that point back to Him. We become imitators of Christ (Philippians 2:1-11). 4) There is an entire history of animosity between Jews and Gentiles that Paul is arguing against. The main point Paul is making is that, as believers in Christ, we are all heirs to the promises God made to Abraham in Genesis 15-17. We have access through faith, not nationality. With Christ’s death on the cross, Gentiles were included in the blood bought promises of God (Romans 11). 1) We have a new identity in Christ! We know the truth of God and His salvation lest we forgot who we are and whose we are! Be reminded today that our faith in Christ is life-giving, transforming, and free from condemnation. The law showed us how sinful and fallen we were because apart from Christ, we can do nothing! 2) The law provides us with a moral compass that we cannot possibly keep, in and of ourselves, BUT faith provides us grace that closes the gap between God and man. We have been freed from the law of sin and death and “there is now, therefore, no condemnation for those who are in Christ Jesus” (Romans 8:1). We are free by the blood of Christ that we may live for the One true God! 3) Every day we can choose to relinquish ourselves to the Holy Spirit working in us to stay the course, fight the good fight, and stay true to the Gospel we know. When we put on Christ, we represent Him to the world. We become His ambassadors, His advocates, and His spokespeople! We love like He loves, we extend grace and give the benefit of the doubt, and we make choice that honor Him! We walk as children of the Light…we live as daughters of the King! 4) Most of us are not Jewish, which means a lot of the Old Testament makes little sense to us, but we cannot understand the New Testament apart from the Old Testament. From the very beginning, God began pointing towards Christ. The Bible, His love story, unfolded in such a way that He would beckon all to know Him that all would experience the grace and mercy that comes from knowing, believing, and understanding who He is. Faith, the law, and the promises of God cannot be understood a part from His Word. It’s so crucial to dig deeply into Scripture to experience His fullness in our everyday lives! Thanks for joining us today as we journeyed into Beauty Week Three! Looking for other journeys from this theme? 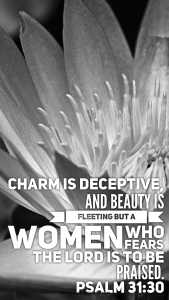 See all past studies in Beauty! I will never forget my favorite dress as a little girl. My mother’s best friend asked me to be the flower girl in her wedding, and the dress she chose for me was a deep royal blue. Looking back, I don’t really remember the wedding ceremony or what anyone else was wearing, but I remember every detail of that dress. It was delicate and lovely and perfect, and I felt so grown up in it. When I put it on, complete with tights and shiny shoes, I knew I looked beautiful. I loved the swish of the skirt as I twirled. The gentle rustle of material as I walked. The way my eyes picked up the deep blue. The way my dad would smile when he saw me prancing around in it. When I was wearing that dress, I felt…different. I was still the same me, but… More, somehow. As a teenager, my default attire consisted of jeans, a simple tee and a sweatshirt when I wasn’t in costume for plays or musicals. Comfort was key, and I didn’t spend much time on dresses, skirts, or anything more than casual attire. I can’t remember a favorite anything from those years, honestly. I remember the first time I tried it on. My husband’s annual work gala was approaching, and I needed something more formal to wear. I was newly pregnant with our first, and the forgiving fit didn’t make me self-conscious about my growing bump. I loved the modest but classy flair, and I remember thinking that for the first time in my life, I looked content. I have never considered myself an incredibly fashion-forward person, but this dress hit the mark. My husband loved it, and I remember feeling so happy that I had found that dress! We had recently recommitted our lives to Jesus and I had been feeling rather isolated as God led us out of some damaging relationships and situations. I was feeling rather nervous about the upcoming gala, but I felt confident in that dress. I haven’t worn it in a few years and babies, but it hangs in the back of my closet, zipped gently in a dry-cleaning bag to protect it from dust. Ring any bells? I know we all have that one item tucked away for memory and hope’s sake. what we choose to wear is a direct reflection of our heart condition. 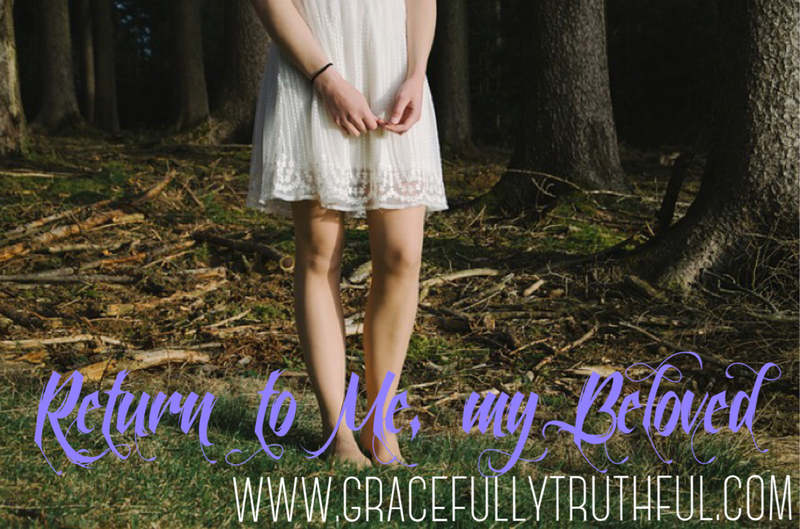 How often do we forget that our clothing choices, both physical and spiritual, are mirroring our Savior? Paul charges us to set our hearts and minds on the spiritual, and to put to death the ways of the flesh. This requires not only a choice, but action as well. My own heart condition at different points in my life is apparent as I reflect on my favorite dresses or outfits. As a little girl, my innocence and naivety is obvious. As a teen, my rebellion and apathy reigned for many years as my heart was irreverent and disrespectful. That translated to my clothing choices…or rather the lack thereof. As a married woman, my hope and desire to make my husband proud while brimming with nerves and excitement over our first baby are clear to see. As followers of Jesus, our heart conditions should make it obvious that we have put on Christ. As we clothe ourselves in Him by staying in His Word and nourishing our relationship with Him, our hearts will grow more transparent and reflect Him more accurately. And as we begin to reflect Him better, our favorite “dresses” might become our spiritual clothes instead. Looking for yesterday’s Journey Post? Check out Unfading Beauty of Legacy! 2) What comparison is made between how man sees and how God sees? 3) What does the word “heart” mean in this passage? 1) In this passage Samuel the high priest, is searching for who will be the King of Israel. He has traveled to Bethlehem where God has told him to invite Jesse and his sons. One of Jesse’s son will become the anointed king. Samuel instructs Jesse to bring each one of his sons before him. Each time Jesse sees physical strength and stature but God says no. When there is only one son left, a shepherd boy, the youngest of Jesse’s son, David, God says this is the one. The one that you, and even Jesse his father, thought as not even a possible candidate, he is the one I have chosen. God saw David’s heart and he was eventually anointed king! 2) The writer of Samuel says that man sees differently than God. We, as humans, see physical features, the outside of others. When God looks, He pierces to the depths of our very soul. He sees us and He sees our heart! 3) When I read the word “heart” I want to make sure that I am thinking right about how the writer is using it. I used Studylight to see the word in the original language and it does mean more than the physical heart or even our emotions. The word means the inner man, the mind, the will, the heart, soul, and understanding of a man. This is how God sees. He knows us intimately and fully! 1) God chose David over seemingly more qualified brothers. When Samuel, the high priest, saw David’s oldest brother, he thought for sure this was the man that God intended to rule Israel. God gently reminded Samuel that physical appearance alone does not leave a legacy that God desires. He looked at the heart of the man David just as He looks at our heart. He knows our desires, our joys, our heartbreak, and pain. He works in us and through us to leave a legacy that is pleasing to Him! 2) God’s ways are not our ways. He is in the habit of choosing the least likely to do the most profound things on behalf of His kingdom. He chose a shepherd boy to rule over the nation of Israel, but when people looked at David, they missed what God saw in him. People, and the standards of this world, do not define your character, your beauty, your heart, or the legacy you will leave for those around you. We, each one of us, make choices every day for who we will be and whose we will be. You decide your legacy because God has already chosen you Beloved to fulfill His purpose and to impact the lives of those around you. 3) “The Lord looks at the heart…” is a scary but thrilling statement. Scary because He sees me and my deepest thoughts and desires, which aren’t always pleasing to Him. In His grace, He molds, shapes, and redeems those thoughts and desires into something beautiful for Him. Thrilling because the God of the universe is intimately acquainted with who I am and He chooses to use me to leave an imprint for Him in this world! See all past studies in Beauty! Seven years ago I typed up these lyrics from Nichole Nordeman’s song, “Legacy” and glued it onto some cardstock before hanging it on a mobile I created to represent “me”. This mobile was shaped like a ring and had several other cardstock pieces hanging from it. One had a picture of my dream home, another a picture of what I wanted to be when I grew up, as well as an array of other interesting things. But this one specific square had a front and a back. On the front were the above lyrics and on the back was a picture of me and my dance instructor. Below our picture, I described how inspiring she was in my life, how she was a wife and a mama but most of all loved Jesus, and I wrote that I wanted to be like her one day. I will always remember this special lady in my life as a classic beauty, but also as a woman who left a legacy in the life of every single person she has interacted with. I think we all know a few women like her. passionately loved God and furiously loved others. In fact, the faces of these women are probably popping up in your thoughts as you read! Ripple-causing women who are making a tremendous impact on this world. Just as noticeable as their love and legacy is that they are marked with an indescribable beauty. Not your typical “People Magazine’s Most Beautiful Woman” beauty. But a beauty that is a completely undeniable, unsurpassable, breath-catching and peaceful. You look at her face, and beyond wrinkles or blemishes, gray hair or red, cute clothes or faded old ones, her face is covered in peace. Deep kindness shines from her eyes. Gentleness and love exude from her. These legacy leavers are beautiful women. But the kind of beauty they possess will never fade. Peter tells us that our beauty shouldn’t come from the embellishments that we put on ourselves, our hair, nice clothing or jewelry. Our beauty shouldn’t be found in our number 670 lipstick shade, or our perfectly highlighted and blown out locks, boutique clothes or tiffany wedding bands. And while none of that is bad, Peter’s point is that our true beauty should be our inner self, the unfading beauty of a gentle and quiet spirit. God, through Peter, reminds us that these gems are of great worth in His sight. One day, if granted the blessing of long life, we will all have faces lined with wrinkles and hair peppered with grey. Our lipstick won’t look the same on our thinning lips and our leggings won’t look quite the same on our matured bodies. If we continue to place our identity in our fleeting beauty, we may find ourselves madly disappointed in the future. 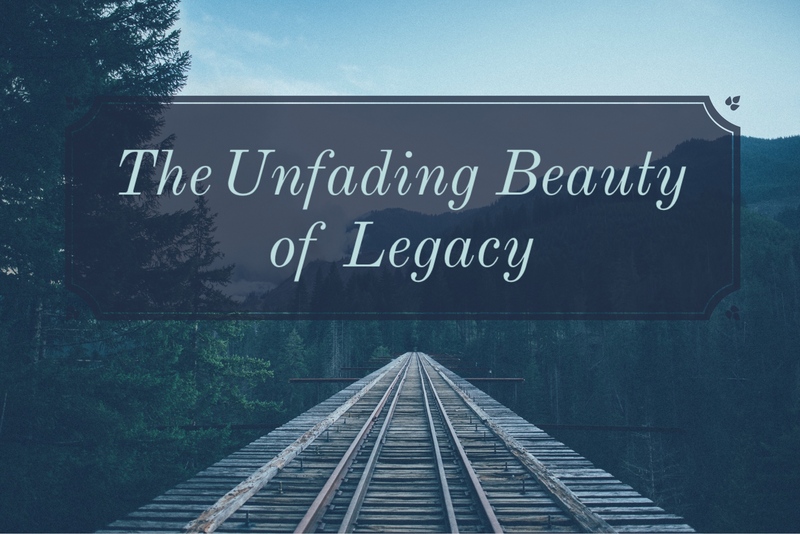 However, if we focus on being women who leave a legacy and honor God with our lives, no matter our earthly age, choosing instead to place our identity in being God-fearing and gentle women, we will never have to worry about a beauty that fades. Beautiful, God-honoring and legacy leaving women. These will never go out of fashion!